This was the sign-in sheet from that first meeting. 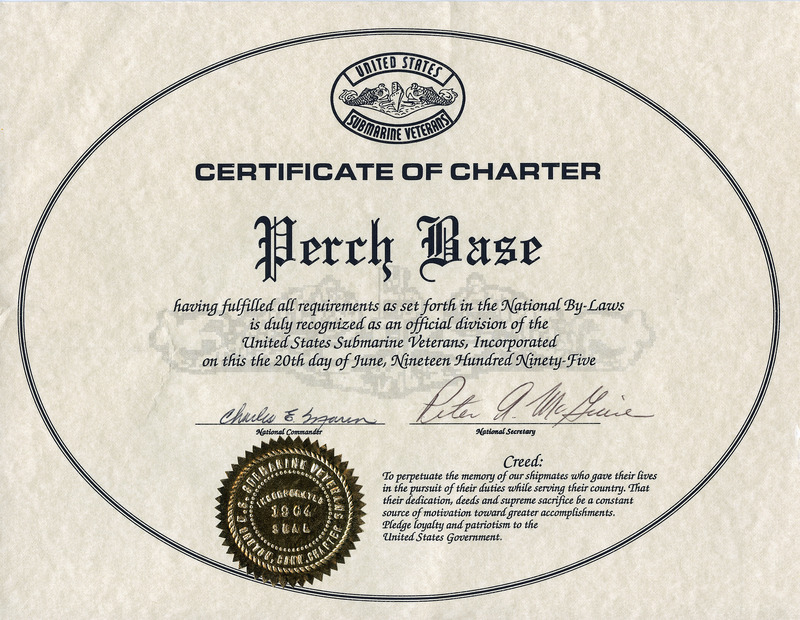 This is the charter establishing Perch Base, which was granted by the national headquarters of the USSVI. 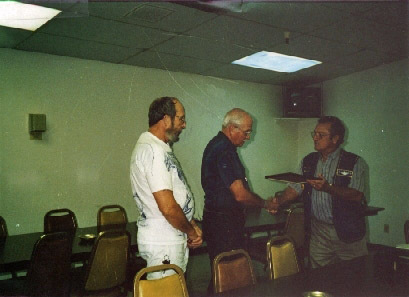 Then USSVI National Commander Charles Marin, presents the Perch Base its Charter to Jim Newman and Frank Rumbaugh -- Commander and Vice Commander -- of the Base on Sept. 23, 1995. The date of the charter, and Base "birthday," is June 20, 1995. Perch Base published a 140 page Perch Base cookbook titled, "Dishes From the Deep," vintage 1996, as a base fundraiser. Thanks to Layne Moss who provided a copy. There are references to sales ($6 + $1 shipping) in the November and December 1999 MidWatch newsletters. There was also a motion passed at the 10 October 1999 Base meeting to advertise the cookbook in the American Submariner . 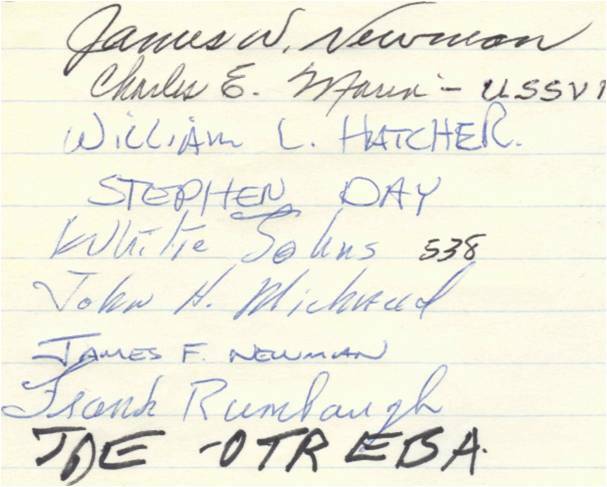 The April 2000 Midwatch also noted that 5 copies were donated to the USSVI Buffalo Base for a silent auction to replace the tiles in their Memorial Submarine, the USS CROAKER (SS246). Besides these winners, Perch Base also received the honor of having its cookbook listed in the "Contributing Cookbook" category within the publication, with the following plug: Dishes From the Deep by Arizona Perch Base Submarine Veterans. 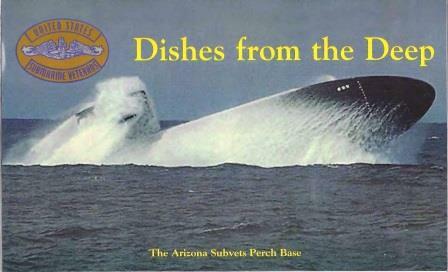 The Submarine Veterans of Arizona Perch Base have come up with a unique 140 page cookbook entitled Dishes from the Deep. All of the recipes come directly from the submarine veterans or their wives who have been preparing them for years (including the famous "SOS"). The majority of these recipes are quick and easy. We believe that all those who purchase it will find it most interesting and delicious. The MidWatch edition thanked all those ladies who worked so hard to make this book possible. Especially, Gayle Loftus, Judy Patterson and Shannon Thomason. The national organization of the United States Submarine Veterans Incorporated (USSVI) is incorporated in the State of Connecticut and is recognized by the IRS as a 501(c)(19) veterans organization with an IRS Determination Letter documenting the Section 501(c)(19) status. This makes the USSVI a "TAX EXEMPT" organization. Thus, USSVI does not have to pay taxes, BUT YOUR DONATIONS ARE NOT "TAX DEDUCTIBLE". Unfortunately, donations are only deductible if at least 90% of the membership are members who have served during congressionally designated periods of war. (Reference: IRS Publication 3386, Tax Guide for Veterans’ Organizations, page 39.) During 2017, our percentage of war veterans dropped below 90%. The percentage of war veterans is periodically re-calculated and we may again qualify in the future. The latest USSVI IRS Form 990 Tax Return is available for public inspection via the USSVI Home Page by selecting the "Documents" button on the left column and then selecting the "Organization" button on the left column of the next page.